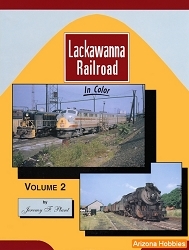 This all color book covers the DL&W during the post World War II years featuring the best of steam, electric and diesel operations. Nearly 200 brilliant Color photographs take the reader on a journey on the 'Route of Phoebe Snow'. These were the diesel years of the Lackawanna, but steam still had an important role to play in both commuter and freight service. Includes a diesel roster, Hoboken Ferry, diesels in black, and of course the Phoebe Snow.